Microplastics are fragments of plastic smaller than 5mm. These are of particular concern as they can be ingested readily throughout the foodweb. Photos reproduced with permission from Amy Lusher. Source: Lusher, A. L., Burke, A., O’Connor, I., & Officer, R. (2014). Microplastic pollution in the Northeast Atlantic Ocean: Validated and opportunistic sampling.Marine pollution bulletin, 88(1), 325-333. The project outreach team working in collaboration with a team of GMIT 4th year college students were given the task of producing education material on the topic of Freshwater Microplastics which they deemed would both interest and engage an audience of Secondary School students. Together they have produced a Poster and an experiment which you are free to use. Both are presented here in pdf for ease of downloading. 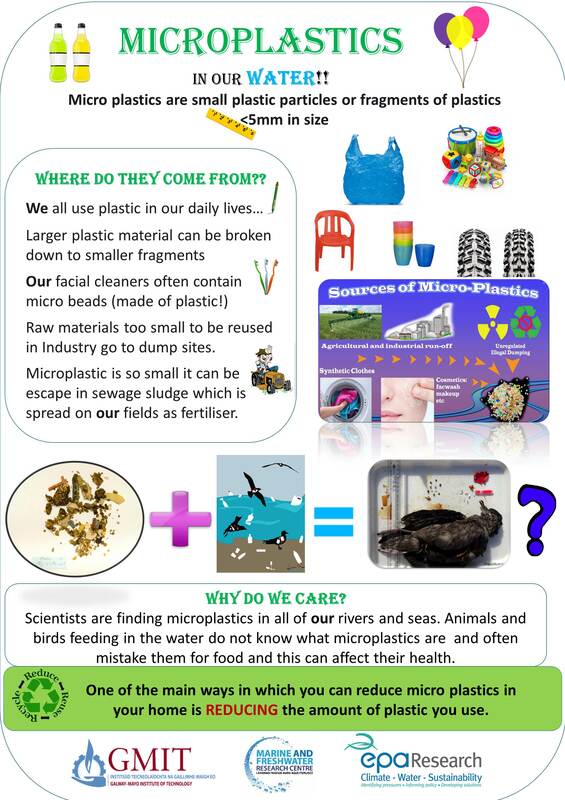 Why not introduce a Microplastics Experiment in your class to highlight microplastics around us.